"Honoring Symptoms as a Voice of the Soul"
Once a week people in the thousands show up for their regular appointment with a therapist. They bring problems they have talked about many times before, problems that cause them intense emotional pain and make their lives miserable. Depending on the kind of therapy employed, the problems will be analyzed, referred back to childhood and parents, or attributed to some key factor such as the failure to express anger, alcohol in the family, or childhood abuse. Whatever the approach, the aim will be health or happiness achieved by the removal of these central problems. Care of the soul is a fundamentally different way of regarding daily fife and the quest for happiness. The emphasis may not be on problems at all. One person might care for the soul by buying or renting a good piece of land, another by selecting an appropriate school or program of study, another by painting his house or his bedroom. Care of the soul is a continuous process that concerns itself not so much with "fixing" a central flaw as with attending to the small details of everyday fife, as well as to major decisions and changes. Care of the soul may not focus on the personality or on relationships at all, and therefore it is not psychological in the usual sense. Tending the things around us and becoming sensitive to the importance of home, daily schedule, and maybe even the clothes we wear, are ways of caring for the soul. When Marsilio Ficino wrote his self-help book, "The Book of Life, five hundred years ago, he placed emphasis on carefully choosing colors, spices, oils, places to walk, countries to visit -- all very concrete decisions of everyday lifethat day by day either support or disturb the soul. We think of the psyche, if we think about it at all, as a cousin to the brain and therefore something essentially internal. But ancient psychologists taught that our own souls are inseparable from the world's soul, and that both are found in all the many things that make up nature and culture. So, the first point to make about care of the soul is that it is not primarily a method of problem solving. Its goal is not to make life problem-free, but to give ordinary life the depth and value that come with soulfulness. In a way it is much more of a challenge than psychotherapy because it has to do with cultivating a richly expressive and meaningful life at home and in society. It is also a challenge because it requires imagination from each of us. In therapy we lay our problems at the feet of a professional who is supposedly trained to solve them for us. In care of the soul, we ourselves have both the task and the pleasure of organizing and shaping our lives for the good of the soul. "Getting to Know the Soul"
Let us begin by looking at this phrase I have been using, "care of the soul." The word care implies a way of responding to expressions of the soul that is not heroic and muscular. Care is what a nurse does, and "nurse" happens to be one of the early meanings of the Greek word "therapeia, or therapy. We'll see that care of the soul is in many ways a return to early notions of what therapy is. "Cura, the Latin word used originally in "care of the soul" means several things: attention, devotion, husbandry, adorning the body, healing, managing, being anxious for, and worshiping the gods. It might be a good idea to keep all thesemeanings in mind as we try to see as concretely as possible how we might make the shift from psychotherapy as we know it today to care of the soul. 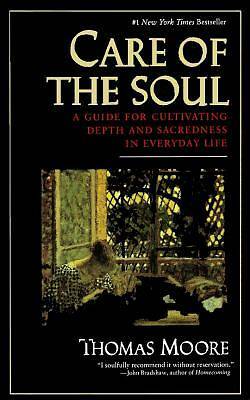 "Soul" is not a thing, but a quality or a dimension of experiencing life and ourselves. It has to do with depth, value, relatedness, heart, and personal substance. I do not use the word here as an object of religious belief or as something to do with immortality. When we say that someone or something has soul, we know what we mean, but it is difficult to specify exactly what that meaning is. Care of the soul begins with observance of how the soul manifests itself and how it operates. We can't care for the soul unless we are familiar with its ways. Observance is a word from ritual and religion. It means to watch out for but also to keep and honor, as in the observance of a holiday. The "-serv- in observance originally referred to tending sheep. Observing the soul, we keep an eye on its sheep, on whatever is wandering and grazing -- the latest addiction, a striking dream, or a troubling mood. This definition of caring for the soul is minimalist. It has to do with modest care and not miraculous cure. But my cautious definition has practical implications for the way we deal with ourselves and with one another. For example, if I see my responsibility to myself, to a friend, or to a patient in therapy as observing and respecting what the soul presents, I won't try to take things away in the name of health. It's remarkable how often people think they will be better off without the things that bother them. "I need to get rid of this tendency of mine," a person will say. "Help me get rid of these feelings of inferiority and my smoking and mybad marriage." If, as a therapist, I did what I was told, I'd be taking things away from people all day long. But I don't try to eradicate problems. I try not to imagine my role to be that of exterminator. Rather, I try to give what is problematical back to the person in a way that shows its necessity, even its value.